A man covered his face to protect himself from the wind as he walks down Eliot Street in Boston. Editor’s note: For the latest on the storm, click here. Blizzard conditions are expected in some areas Tuesday as a major nor’easter sweeps into Massachusetts, whipping up high winds and dumping up to 2 feet of snow on a region weary — and wary — after two other powerful storms in as many weeks. “The storm itself is probably going to cover the entire length and width of the Commonwealth,” Governor Charlie Baker said. The National Weather Service issued winter storm warnings for Boston and much of the rest of the state, and forecasters warned of “near impossible travel conditions” for the Tuesday morning commute. As of Monday night, the forecast called for snowfall to “ramp up in intensity from south to north around 4 a.m.” Tuesday, according to state officials. Snowfall will peak around 2 p.m. to 3 p.m., then begin to slow down around 8 p.m., and forecasters said it will stop in Boston around 10 p.m.
There’s another nor’easter predicted to hit the Boston area on Tuesday, and this one is packing a snowy punch. At a news conference in Boston, Baker urged drivers to stay off the roads. Heavy snowfall — as much as 3 inches per hour — was expected to create low visibility. MBTA service was also expected to be sharply limited. He said winds along the coast could gust to 60 miles per hour. 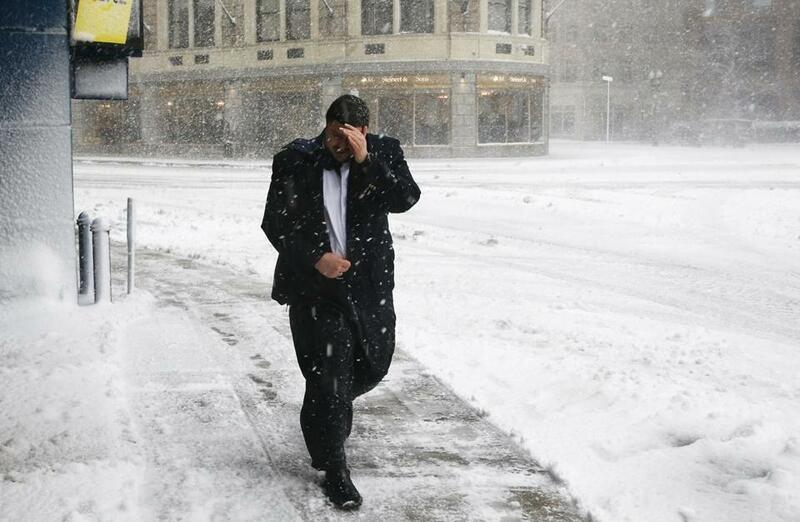 In Boston, the forecast called for at least a foot of snow, with near-blizzard conditions. “I feel that we haven’t really seen this type of storm since 2015,” said Boston Mayor Martin Walsh. A blizzard warning was issued for coastal areas north and south of the city, for Cape Cod and the Islands, and in parts of Southeastern Massachusetts. A blizzard is defined as a period of at least three hours when winds blow at 35 miles per hour or more, accompanied by heavy falling or blowing snow that reduces visibility frequently to less than a quarter-mile, forecasters said. School districts across the state cancelled school Tuesday. In Boston, the closure extended the school year to June 26. Boston schools are planning to open Wednesday, Walsh said. Forecasters said minor coastal flooding in Boston is possible. High tide on Tuesday morning could bring a storm surge of 2.5 feet, according to the National Weather Service. To the south, moderate flooding was expected. On the South Shore, towns were braced for yet another shellacking. Portions of Scituate’s sea wall damaged in the last two nor’easters have been temporarily repaired using large stones, but Murphy said he is also concerned that if the temporary repairs don’t hold up, the town could have a big problem. Last week’s nor’easter brought heavy, wet snow and another bout of strong winds that frustrated hundreds of thousands of utility customers, especially in Essex County, where it took days for crews to restore power and heat. Even as late as Monday evening, some people in Eastern Massachusetts were still in the dark. National Grid had 180 customers without power; Eversource had 309. Forecasters said Monday they were expecting a dry, fluffy snow across much of the interior of the state, but there was some risk of heavy, wet snow in southeastern sections of the state, particularly Plymouth County and Cape Cod and the Islands, which could bring down power lines and cause another round of power outages. But they reassured customers that emergency response crews would be available to help. “We have hundreds of employees and contractors ready to respond and will again have crews positioned well before the storm hits so we’re there when customers need us to safely and quickly restore power after an outage,” Doug Foley, Eversource’s vice president of electric operations, said in a statement. Ahead of the expected storm, more than 500 flights from Logan Airport Tuesday were cancelled, officials said. On the MBTA, commuter trains were expected to run on an “extremely reduced schedule,” officials said, encouraging riders to check mbta.com for updated train times. The Orange, Green, Red, and Blue lines will operate with seven to 10 minutes between trains, officials said. The Wollaston Station bus shuttle will run all day, and the Mattapan Trolley Line will be replaced Tuesday with shuttle bus service. State officials urged people to avoid driving if possible. “Drivers should make smart decisions on whether or not they need to be on the roadways during this storm and consider measures such as delaying travel plans until after the snow has fallen,” said Jonathan Gulliver, the state’s highway administrator. Officials also urged people to check on elderly neighbors, keep adequate food and medicines on hand, and check their heating fuel supplies. On Wednesday, temperatures in Boston will be in the 30s, with the possibility of rain showers. Overnight temperatures into the weekend are expected to be in the 20s in Greater Boston and colder in the suburbs. This has been a particularly snowy March. It could be just the eighth time that Boston has received at least a foot of snow over two consecutive days in March or later, according to weather service records that date back to 1891. The snowiest storm ever in March or later actually spanned the months of March and April. 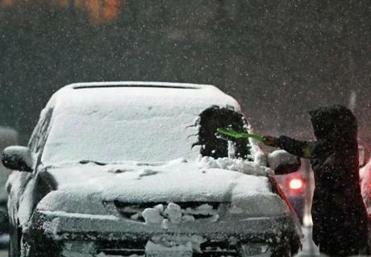 The belated blast of winter dropped 25.4 inches in Boston from March 31 to April 1, 1997. It became known as the April Fool’s Day Blizzard. Sean Smyth, Joshua Miller, and John R. Ellement of the Globe staff contributed to this report.